(For the fifth celebration of Coniston still being in Lancashire). Coniston and Hawkshead are still in the County Palatine of Lancaster, and the Queen is still the Duke of Lancaster. 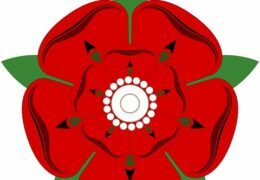 So for an enjoyable evening out come to the Coniston Institute for a traditional Lancashire evening with good fare, a drink and entertainment from the Lancashire singing group recalled by popular demand. Tickets are £17 each which includes the Traditional Lancashire Supper (two courses), a glass of something to wash it down AND all the fun you can have. Because we need to know how many of you will be attending so that we do not run out of supper, please book your tickets in advance from Twinning Association Members all on 015394 Anne Hall 41558, Jackie Coe 41654, or Derek Adams 41732 or 07973 179805 or email no1@dsadams.co.uk. Sponsored by the Coniston and District International Twinning Association. Any profit will be for the benefit of Village Organisations.